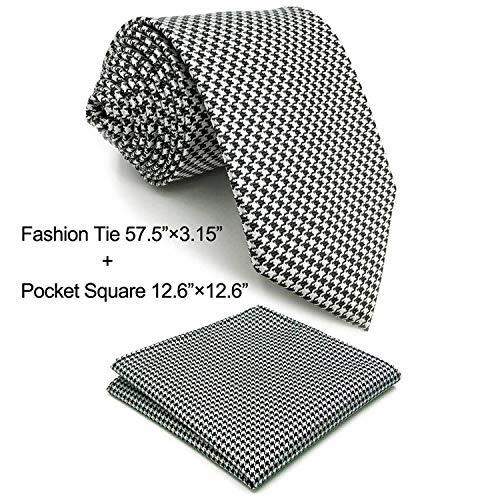 This option includes one classic size necktie and one pocket square. NOT pre-tied. Packed with neat single plastic bag. Necktie size: 57.5" x 3.15". Pocket square size: 12.6" x 12.6". The pocket squares is full size and will not slide down in your jacket pocket. You can easily fold any shapes you like. The foulard necktie is a neat geometric repeating pattern and is appropriate for business meetings, other formal settings or even less formal occasions. The foulard tie is a classic tie that is appropriate in any situation. We was originally founded in 2008. We carry the best quality and designs of neckties, pocket squares, lapel flowers, and cufflinks. If you are shopping online for quality mens accessories, we definitely have what you are looking for. We are committed to offer you the finest items at great prices, meanwhile with exceptional customer service. Shlax&Wing Polka Dots Blue Neckties Men Ties Silk Business Extra Long 63"
Shlax&Wing Mens Blue Yellow Geometric Tie Classic Long 63"